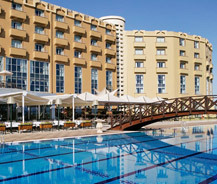 Hotel Mercure which is situated in Northern Cyprus of Kyrenia has an area of 50,000 square meters. This hotel is situated at a distance of 55 km from the Ercan Airport and it is just 6 km from the city center. This hotel in total has 299 rooms with a capacity to 648 beds. In this total of 299 rooms there are 279 standard rooms and the remaining 20 rooms are of various categories. In these 20 rooms 2 rooms are for disabled people with all facilities which satisfy their needs, 14 ordinary suites, 2 deluxe suites and 2 non-smoking rooms. As usual the rooms contain features like satellite TV, hair dryer, heater, cooler, air conditioner, bathrooms with shower, mini bars, internet access facilities and LCD TV which every five star hotel rooms should contain. It also has various restaurants inside the hotel with various categories. Also it provides an elegant look for people staying in this hotel as it offers both the looks of Mediterranean Sea and the Mountains. Other than this the hotel offers the visitors various facilities like Mercure Spa and Wellness Center which helps in maintaining health and also recently it has opened a new casino which is quite big in size as it is the largest casino in this island. You can enjoy your holidays here with great pleasure as it offers various facilities other than ordinary hotels.